Turn your iPhone or iPad into the hub of a distributed sensor network with the help of an Arduino microcontroller. 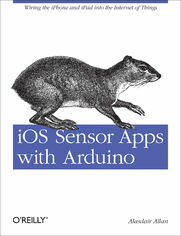 With this concise guide, you&#8217;ll learn how to connect an external sensor to an iOS device and have them talk to each other through Arduino. You&#8217;ll also build an iOS application that will parse the sensor values it receives and plot the resulting measurements, all in real-time. iOS processes data from its own onboard sensors, and now you can extend its reach with this simple, low-cost project. If you're an Objective-C programmer who likes to experiment, this book explains the basics of Arduino and other hardware components you need&#8212;and lets you have fun in the process.